“Beatriz at Dinner” might be called a comedy of discomfort. Actually, there’s a lot more discomfort than comedy. Scripted by Mike White (“The Good Girl”) and directed by Miguel Arteta (a veteran of numerous TV seres), “Beatriz” offers a fish-out-of-water scenario brimming over with class, race and political implications. Beatriz (Salma Hayek, sans makeup and sporting a mildly horrifying set of bangs) is a New Age-y therapist whose skills run from your standard massage to aura readings. On this particularly day she has schlepped out from her headquarters in Pasadena to see to the needs of one of her richest (and, it seems, most demanding) clients. With the massage session over, Beatriz prepares to drive home, only to find that her car won’t start. Cathy — who credits Beatriz’s therapies with getting her daughter through a bout with cancer — graciously suggests that the masseuse join the other guests for the evening. How has it taken Hollywood this long to glom onto such an awesome concept? Consider: An efficient, ruthless assassin whose Asperger-ish condition guarantees that he won’t empathize with his targets no matter how much they beg. A stoic largely immune to crippling emotions like guilt, fear and panic. A wrecking machine who can pass for civil but at heart cannot create lasting attachments. An obsessive who, once he’s started a job, is driven to finish it. I’d pay to see that movie. Oh, Ben Affleck’s latest makes noises like it’s heading that direction before deteriorating into silliness and mayhem. But the pieces never add up. Affleck plays Christian Wolff, a CPA with an office in a south Chicago strip mall and a roster of mom-and-pop clients. But that’s only his cover. In reality Christian is a mathematical savant and emotional cipher whose clients include drug cartels, mobsters, international arms dealers and other nasty folk. Whenever these crooks suspect that someone has been pilfering cash or cooking the books, they call in Christian to do a little forensic sleuthing. With a mind like a mainframe computer, he always finds the culprit — who usually ends up in a landfill. It’s dangerous work but pays well. In a rented storage facility Christian keeps an Airstream trailer packed with cash, weapons and authentic Renoir and Pollack canvases (which he has accepted from grateful clients in lieu of cash). And as flashbacks reveal, he’s also deadly, having been trained by his military father in martial arts, ordnance, sniping and other skills that might be useful for a kid who is always being bullied. Because while I don’t regret having spent three hours watching Christopher Nolan’s “Interstellar,” I can’t quite shake the feeling that there’s less here than meets the eye. That maybe the Emperor has no clothes. The film has an epic scope, great visuals, good performances and a payload of scientific/metaphysical ideas percolating throughout. And unlike many of Nolan’s efforts (among them the most recent incarnation of Batman, “The Prestige” and “Inception”), it has a backbone of genuine emotion. But why, when the lights came up, was my reaction more “meh” than “wow”? The film begins in a not-too-distant future. Earth is rapidly dying. Corn is about the only crop not devastated by blight and massive dust storms. Former astronaut Cooper (Matthew McConauhey) works a farm in what might be eastern Colorado. A widower, Coop lives with his father-in-law (John Lithgow) and his two kids. He’s got a special relationship with Murph (Mackenzie Foy), a fiercely intelligent girl who reports ghostly goings-on in her room, with books being pulled from the selves by invisible hands. This activity and other clues lead Coop and Murph to a secret base in the mountains where what’s left of NASA (as far as the public knows the program has been shut down) is working on a project to save humanity. Coop’s old mentor Professor Brand (Michael Caine…always the voice of reason in Nolan movies) explains that a decade earlier a human crew was sent into space, through a wormhole near Saturn, and into another galaxy to look for Earth-like planets to which humanity might migrate. That earlier mission is presumed lost. Now a second is being mounted. Coop’s arrival is serendipitous — he was NASA’s best pilot — and he is recruited to head the new effort. But that means saying goodbye to Murph, who is angry and devastated by what she sees as a betrayal by her beloved father. This takes up “Interstellar’s” first hour. 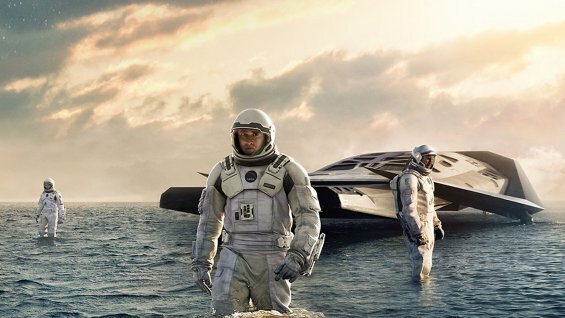 The rest of the film alternates between the mission in space and the lives of Coop’s family back on Earth. Though its two central characters are men in a long-term relationship, it would be a mistake to categorize “Love is Strange” as a “gay” movie. In fact, Ira Sachs’ melancholy drama is clearly inspired by the 1937 film “Make Way for Tomorrow,” in which an elderly couple run out of money and after a lifetime together must separate to be farmed out to their selfish children in different cities. “Make Way…” tops my list of the most downbeat (though brutally honest) films ever produced by a major studio during Hollywood’s Golden Age. 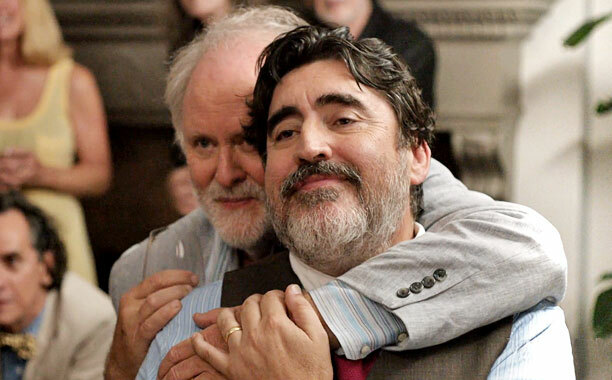 We meet Ben (John Lithgow) and George (Alfred Molina) on the day of their wedding ceremony. They’ve been together for four decades, and are now taking advantage of recent judicial rulings to make it legal. Ben is the older by 10 years, a retiree who still dabbles in painting. He’s a bit fussy, the worrier of the pair. George is the more expansive and upbeat partner. Staying upbeat, though, is a challenge after George is fired from his longtime job as a music director at a Catholic high school. His sexuality and living situation were never a secret, but by getting married and announcing the news he has violated Church policy. In addition to losing a paycheck, he forfeits health insurance coverage for himself and Ben. 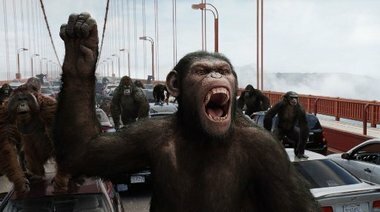 At about the one-hour-and-20-minute mark the simian protagonists of “Rise of the Planet of the Apes” rebel against their human captors/tormentors and run amuck in San Francisco. And for a few moments this moribund movie comes to life. Getting to that point, though, is a real slog.